How To Play Blackjack - Basic Strategy for Ultimate Results! Blackjack is one of the most popular casino table games in existence. 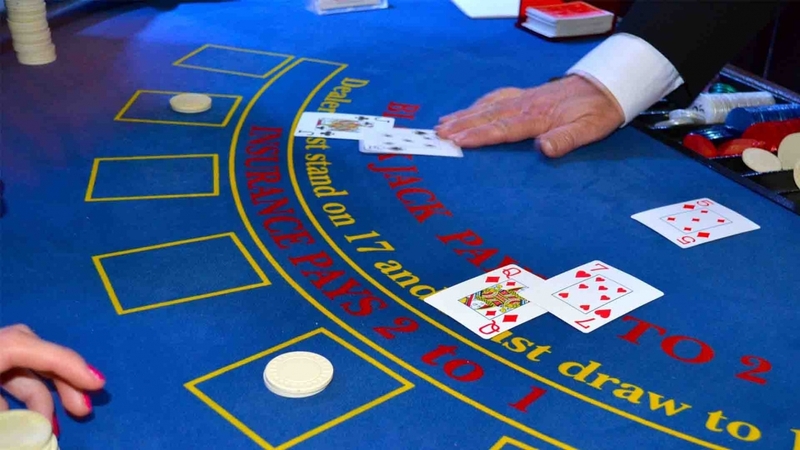 Not long after hitting casino floors, blackjack has become one of the players’ favorites, its popularity comparable to only one other game, roulette. Simple to play, yet very exciting, blackjack has a very special appeal because it is one of the rare games played against the house where your decisions can actually make a lot of difference. So, it’s not just a game of luck but a game of skill as well, at least to a degree. Not surprisingly, the game had no problems finding its way to online casinos very early, and those wanting to play blackjack online have always had plenty of opportunities. These days, with the online gambling industry booming, there are hundreds of online casino where players can enjoy all the different varieties of the game. If you’re new to blackjack and looking to get started, this extensive guide will provide you with all the information you need, teaching you not just the basic rules but showing you how to play blackjack in the optimal way so as to reduce the house edge as much as possible and give yourself the best chances of winning or, at the very least, losing the minimum. Before we move on to the actual gameplay, let’s first look into its history. While this may not help you become a better blackjack player, it certainly won’t hurt you to know how the game came to be so popular around the globe. The first mentions of the game called Twenty One, which was the precursor of the modern-day blackjack, go back to the early 17th century. It seems the game originated in Spain and from there, it expanded to the United States. It was in the US that blackjack really gained its popularity and the name we know it by today. Namely, gambling venues across the States wanted the game to take off and be accepted by the players, so they introduced special bonuses for winning with a hand consisting of an Ace of Spades and any black Jack (clubs or spades). From that point on, the popularity of blackjack continued to grow and the game was immortalized in many books and movies talking about card counting teams who took on the house and walked away with millions. All of this had happened long before the blackjack online was introduced but it set foundations for the popularity the game enjoys to this very day. Before we proceed to explain the rules and game strategies, there is one thing every player should know, whether they play blackjack online or in a live casino. No matter what you do, the casino always retains an edge in the game. The only exception to this rule is if you’re really good at counting cards (which will be addressed later) but this isn’t a strategy you can use online. There are different variations of blackjack with slightly different rules, but in a usual game of blackjack with between six and eight decks, the house edge will be between 0.4% and 0.5%. This, of course, if you fully understand and always stick to the blackjack basic strategy (also explained further in the text). With the optimal play, you won’t be losing a lot and you’re guaranteed to have many more winning sessions, but you still won’t be able to beat the house. Still, these are much better odds than most casino games offer, so if you enjoy table games as it is, blackjack is definitely one of the top options. After this introduction to the game, it is time to get down to business and explain how to play blackjack if you’ve never had a chance to play this hugely popular game. The good news is, as far as the play is concerned, blackjack is very easy to learn. The game begins with the players placing their bets and the dealer dealing each of the players at the table one card face up and taking one card himself, also face up. Then, another round of cards is dealt to the players face up, while the dealer takes his second card face down. Once all the players have made their decisions, the dealer will turn over their second card and proceed to play following very strict rules. If the dealer’s total is 16 or less, they must take another card. If their total is 17 or higher, they are done and they can’t take any more cards, regardless of what other players at the table are showing. If the dealer busts, everyone with a still active hand (not busted) wins. If the dealer has a score between 17 and 21, their total is compared to other individual totals. If a player has a higher total than the dealer, they win and are paid even money on their bet. Otherwise, they lose. If a player has the exact same total as the dealer, the hand is declared a “push” and the player gets back their bet but wins nothing on top of that. We’ve explained what the blackjack was back in the day. In the modern games, however, blackjack is any combination of two cards containing any Ace and any card that has the value of 10. If you’re dealt a blackjack, the hand is immediately over for you and instead of winning even money you’ll be paid 3 to 2 in most casinos. So if you bet was $10, you will get $15 and so on. If you understand these basic blackjack rules, you already know how to play the game. However, there are a few more rules you should be aware of to make the game more entertaining but also give yourself the best chance to win most money in any particular hand. If you’re dealt two cards of the same rank, regardless of the suit, you’ll be allowed to “split.” This means you’ll be able to turn your single hand into two separate hands. To do this, you’ll need to match your initial bet for the second hand as well and, from that point on, you play each of the hands separately according to the same rules described earlier. An exception to this is when you split Aces as in most instances you’ll only be allowed to get one extra card for each of the hands. The ability to double on a blackjack hand is exactly what it sounds like. You’re given an option to double your initial bet before receiving the next card. With most blackjack online and land-based variations, you’ll only be allowed to double when your first two cards amount to 11, 10, or 9. If you decide to double, you’ll match your initial bet and receive just one more card. Whatever your next card is, that will be your total, as you’re not allowed to ask for more cards once you decide to take the option to double and will have to wait until the hand plays out. In some blackjack variations, players are given an option to surrender their hand when the dealer’s up card is 10 or an Ace. Basically, you’re betting on the dealer having a blackjack and you can decide to give up on the hand, losing only half of your initial bet. Although some game variations might feature some additional rules, this is pretty much a full answer to the question how to play blackjack. If you memorize these rules, you’ll be fully ready to play blackjack online or at your local casino. But, there is more you should know before you put your money on the line. As a quick note, surrendering your hand is almost always a bad idea and you will be fine if you never, ever surrender. Casinos prefer players who only know how to play blackjack in terms of rules and not much else. This gives them a significantly bigger edge than what was mentioned at the beginning of this article. Depending on your decisions at the table, the house edge in blackjack can actually increase to five or six percent, which is quite huge. To avoid this and to give yourself the best chance when playing, the only route you can go is called blackjack basic strategy. You can forget about all the fancy things you’ve seen in the movies or read in the books. Blackjack basic strategy is exactly that – basic and quite easy to learn. Of course, you’ll need to put in some effort but, realistically, this strategy can be easily learned in a few days. The basic strategy for blackjack relies on the known information, the cards you’re dealt and the card the dealer is showing, and you should make your decisions based on how these two stacks up against each other. In blackjack, ‘soft’ hands are the ones containing an Ace, which means the total can be counted twofold. For example, an A and an 8 can be both 9 and 19. You can never go bust when taking a card holding a ‘soft’ hand. If you’re completely new to the blackjack strategy, the whole thing may seem a bit confusing at first. However, once you start using it, you’ll begin to recognize certain patterns, which will make it much easier to do the right thing almost every single time. With more time and practice, you should be able to play the perfect game of blackjack every time. A good thing about living in a modern age is that you can apply the basic strategy while playing blackjack online and you can actually have this text or a strategy chart open at all times. That way, you can quickly consult it before you make your decision. Keep in mind, there is absolutely nothing illegal about using the blackjack basic strategy and some land-based casinos will even let you take a strategy card with you to the table, but most people are ashamed to do it. By perfectly using the blackjack basic strategy, you’ll seriously reduce the house edge, bringing it down to around 0.4%, which is really huge. You still won’t be beating the casino, of course, but you’ll be playing in a game with much better chances. Blackjack and counting cards go hand in hand, especially in the popular culture. The ability to count cards, combined with the blackjack basic strategy, was the very thing that made it possible for various players and teams to make money off the casinos. In a nutshell, card counting means keeping track of the cards in a shoe in a simplified way, tracking how many good and bad cards are still remaining. The exact breakdown depends on the counting system as there are more than one, but the good cards are always 10s and Aces, for obvious reasons. So, can you take the principles of card counting and apply them to blackjack online just like the basic strategy? Sadly, the answer to this question is a resounding NO. Computerized blackjacks are operated based on a Random Number Generator (RNG), which means once the hand is finished, all cards are back in the mix. A traditional game of blackjack is played with six or eight decks. The dealer draws cards and when the hand is over, he moves them to a separate pile, so you can know that a certain number of 10s or Aces (and other cards) is now not in play. With computerized games, however, this is not the case, as there are no actual cards and every new hand is played with the full range of cards. Blackjack may have started its life as a single game but, over the years, different people and casinos have come up with different ideas slightly tweaking the basic rules. In general, if you know how to play blackjack, you’ll have no problems with any of the variations you might encounter, but it doesn’t hurt to know what you might come across as you play online blackjack. You might come across other variations as you play blackjack online at different internet casinos. The rules are always pretty much the same and these subtle differences are usually announced clearly when you join the table. Keep in mind, however, that some variations are more player-friendly than the others. We can’t afford to go into explaining all of this in this one text, but a good rule of the thumb, if you’re about to play a new blackjack variety, is to do some research beforehand. Now that you know how to play blackjack and are aware of the blackjack basic strategy, you have the tools you need to play this popular game pretty much as good as it can be played. There are some tweaks to the strategy depending on special rules and the exact number of decks, but you’ll be fine with it in most modern-day games. So, the last thing remaining is to pick an online casino for your blackjack play. There are a couple of things that are the most important here as not all casinos are equally good for blackjack players. First of all, there is the matter of the welcome bonus. Most casinos will let you have some extra cash when you first join and this is issued as a welcome bonus. For example, you deposit €100 and receive another €100 to play with. Up to this point, this is all great, but the problem arises from the fact that all bonuses come with wagering requirements, which is the number of times you have to wager the bonus money before it is released. For example, to be allowed to cash out that €100 and any winnings related to it, you might need to wager €3,500 or €4,000. This still sounds great, especially if you consider the house edge when applying the blackjack basic strategy is really low. However, casinos are aware of this fact as well, so often, your contribution when playing blackjack online will be counted at 10%, 5%, or not at all. So, instead of having to wager €4,000, you’ll need to wager €40,000. That’s a lot of money for a €100 bonus. So, if you want to play blackjack online and are keen on taking advantage of the bonus as well, you’ll need to do some research. There are some casinos that actually offer much better percentages and there are even places with specialized table game bonuses where your wagering will be counted at full. Usually, these bonuses are somewhat smaller, but it is still better than having to wager dozens of thousands just to clear a couple of hundred. The second thing to look into is the variety of blackjack games offered by a particular casino. If you’re someone just learning how to play blackjack, you might be fine with just a few basic variations, but as you learn more, you might want to venture into other varieties as well. These days, many online casinos also offer live dealer blackjack tables. These are great for players who already know how to play blackjack but aren’t too comfortable with playing blackjack online. These games are dealt by flesh and blood dealers using real cards so you don’t have to worry about random number generators, games being rigged, or anything of the sort. It’s the same game you play at your local casino but you get to play it from the comfort of your home thanks to modern technologies. After reading this text, you should not only know how to play blackjack but you should know how to do it well. From rules, over the blackjack basic strategy, to find the best online casinos for blackjack players, this guide covers everything you need to get started with blackjack online and do it right straight from the get go. In the end, we can only summarize a few most important takeaways from this text and wish you the best of luck at the blackjack tables. Vital Spin & Go Strategy Adjustments Best MTT Poker Tournament Strategy Tips!